See also Gridder Box by Jamie Place (FontBlast), Gridder Bold by Jamie Place (FontBlast), Gridder Soft by Jamie Place (FontBlast). Info: Created on 8th October 2012 . Last edited on 18th October 2012. 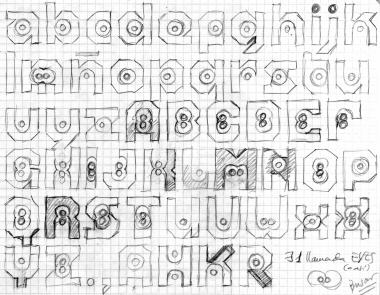 I've tried one like this font (only over the paper). I like your results. Please, continue it. The spacing is too wide. Select Menu>View>Letter Width, and place to green line at the right side of each letter leaving no gaps. Then, select Preview>Menu>Spacing, and set the space with fractional precision.